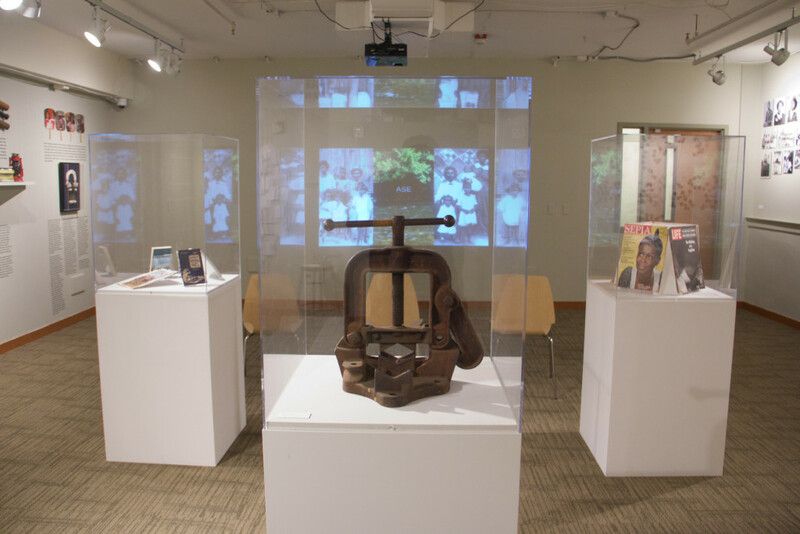 This is an image of my show ‘An Elegant Utility’ at The Northwest African American Museum. Here are some thoughts about this image and why I it appeals to me. I took this image to document the installation. Mainly because a literary journal is publishing some text excerpts from the show and wanted a photo as accompaniment. I was moving through the gallery taking photos and literally stumbled upon this composition. I took a few frames and my instincts as a photographer kicked in. Patience. I stayed in this spot feeling that at some point the perfect combination of elements would emerge. When all of the elements seen in this photo fell into place I knew this was the image I wanted. Here is how I interpret this image. This is an exhibit of oral history narratives triggered by and paired with physical objects. Central in this image is a plumber’s vise, a tool saved from my grandfather’s workshop. Although I ascribed no narrative to this object it is the metaphorical heart of the show. In using family narratives to explore what it meant to build Seattle’s black community in the 20th century, I meditated continually on the cultural values around family and community cohesion, borne of our West African origins, surviving slavery and amplified by intense American white supremacy and institutional racism post emancipation, as i experienced them personally. Specifically I was interested in how our evolution as a people relied on our ability to maintain a sense of collective identity despite radically divergent social, political, cultural and political points of view and the attendant conflicts that emerge within our families and communities. In my family I experienced this first hand as intense conflicts formed around these very fault lines. Some of them led to very real and volatile fallouts that lasted for years. Eventually, even as the sources of some of the conflicts were never resolved, the alliance of blood held us together. The vise is positioned in the very center of the gallery space, which as I stated previously, reflects its role as the thematic core of the show. I have ideas in my project notebook about text that may accompany this object in future iterations of the show. Here however I let it stand without overt commentary. I thought a lot about this treatment and decided that, with all of the presentation options in this space, offering it as a ‘silent metaphor’ was the strongest choice. In fact all of the objects in the vitrines function in this way. They are metaphors for all the things that typify how philosophical, social and cultural diversity in our communities lead to conflicts and divergent ways of being; all aspects of our existence that are held together, improbably, by a central notion and experience of ‘blackness’. In this show political nature of blackness is translated through the lens of our sense of family identity. Most people visiting the show won’t tap into this. In fact I am certain nobody would without my statement of intent. For me, this positioning represents on opportunity for the show to have a kind of esoteric quality that I endeavor to bring to all of my work. It is a personal point of meditation for me every time I enter the gallery. As such I have afforded myself a kind of ongoing ritual experience with this show. In the background the show’s video projection cycles through two distinct presentations. One is an oral history segment that, in broad strokes, charts the chronological evolution of our family in Seattle’s Central District. The other is an evolution of one of the video projections that I originally created for my show ‘This is Who We Are’ at the Frye Art Museum. This second video is a libation/invocation to and of family ancestors. It is purely meditative. In this frame the video bears the image of our familial ancestors in two family portraits taken in rural Arkansas sometime in the 1920s. The video image is simultaneously seen in the background through the vitrine holding the plumber’s vise, and becomes a part of the case itself as its light reflects off of the transparent panels. Thus the plumber’s vise, as a silent metaphor for communal cohesion, merges with the video image that embodies our familial origin story. The esoteric qualities of two of the shows elements around communal identity and cohesion come together as one artifact in this image. Finally the word Yoruba word ‘Ase’, meaning ‘so be it/may it be so’ is featured dead center. ‘Ase’ as a term of declaration and/or punctuation at the end of prayers, evokes the power to make things happen or to create change. In libation it is a part of the invocation of ancestors, calling them into our ceremonial/ritual space as active participants in our Earthly endeavors. In the video the word ‘Ase’ follows a series of names of family ancestors and so functions in the media the same as the libations we perform when we gather in community. And so with all of these things coming together in one serendipitously captured image, I am honored to have and share this photo.